The Asheldham Centre is located on the edge of the mysterious Dengie area of Essex in one of the remotest parts of the county. The building is a medieval church converted into a fully self contained residential Centre accommodating 26 people. It is a 'jewel-in-the-crown' to any groups or individuals that have visited the place. In 2017-18 we welcomed over 2,000 young - and not-so-young people to Asheldham. Virtually all our clients re-book, and we are always privileged to welcome them back. Between November 2014 and August 2015 the Centre had a major refurbishment; in fact it is, largely, a brand-new facility. Since Spring 2010 The Centre has been managed and run on a day-to-day basis by Barry Howard with a small team working hard to make the Centre suitable to the wide needs of groups arriving week by week. We hope to enhance the Centre's unique ambience by facilitating yet more top class courses throughout 2018-19. These courses will include the regular schools' outdoor learning and church youth groups' day and residentials, but with the addition of all-age technical survival courses, wilderness behaviour therapy for youth, and the beginning of a new (and exciting) project for Asheldham: geography and local history field-study courses for KS2 - 4. 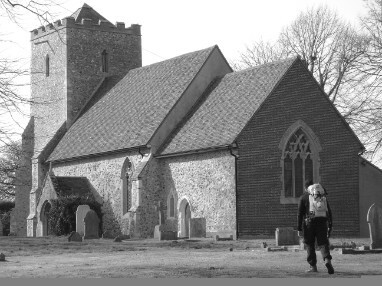 "The church at Asheldham is of national importance, having been one of the first medieval parish churches to have seen systematic recording back in the 1970s when church archaeology was in its infancy. The careful analysis of the standing structure, combined with excavations below ground, revealed previously unsuspected complexity in the development of this building that has formed the heart of the Asheldham community for around a thousand years. The landscape around Asheldham has a unique character with the fields and roads laid out in a curious rectilinear way that could be even older."